With Summer just around the corner, its time to put away the hot drinks and reach for the juice, so The Tot Testers have been trying Bottlegreens latest flavour. The Tots both love to drink juice, and its a regular part of their day, so it wasn't too hard to persuade them to drink the Strawberry and Elderflower drink we were sent. The drink comes in an attractive glass bottle (yes, its recyclable!) and doesn't immediately say "kids drink" to an adult, which is great for those of us at summer barbecues who are resigned to being designated driver, and don't want to stand around looking like one of the children! Its dilutable as well, so at first it looks like the drink wont go very far, but once you dilute it, it lasts for quite a few glasses. It also means you can weaken it for the children to stop them over endulging on sweetness. However the fact its added to water doesn't mean it lacks taste at all, it is easy on a blind test to tell that it contains strawberry, and is really refreshing too. As an added bonus all their cordials contain no added colourings, flavourings or sweeteners, something which will reassure health conscious parents everywhere. And for a really adult version of the drink, head on over to their great website, for cocktail ideas just right for the summer. 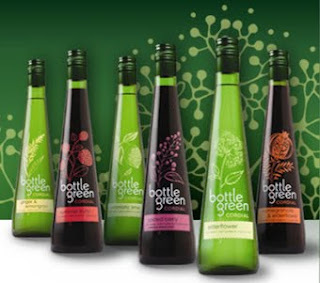 You can find Bottlegreen cordials in a variety of flavours at most good supermarkets.